This gorgeous Bridger Canyon horse property comes with an iconic Guardian Spirit—The Bridger Canyon Whale, a landmark considered the Guardian Spirit of Bridger Bowl skiers. The carved wooden whale reigns atop a 20-foot pole at the property’s entrance, just past the 11 Mile Marker on Bridger Canyon Road. Originally carved and mounted in 1973, local legend has it that if skiers look away from the whale on their way to Bridger Bowl and then salute the whale after a day of epic and safe skiing, they will live to have another excellent ski day. The whale has quite a history. Even though it has been stolen three times, it always returns home unscathed. Restored in 1999 by its creator, George Rice, the present property owners reinstalled the icon on a higher pole placed further into the property, thus stopping other attempts of larceny. The whale may be the first thing you notice about this property, but the setting’s beauty quickly commands your attention. 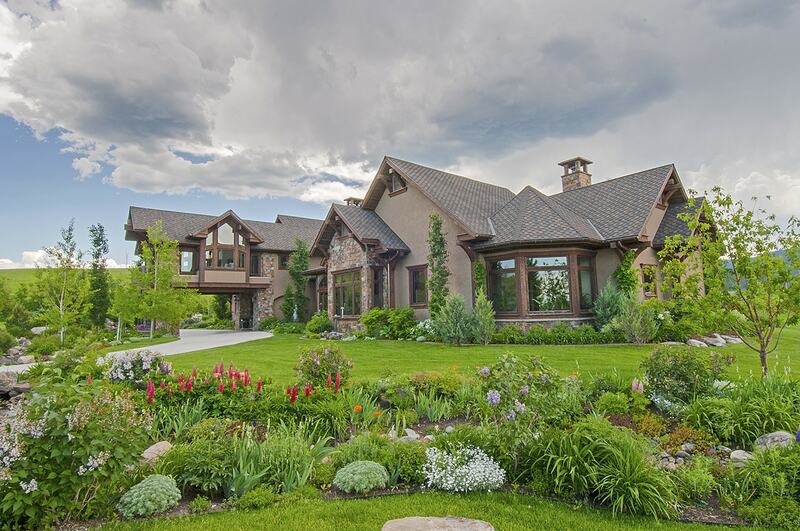 Situated on just under 10 acres in a small pristine alpine valley nestled off Bridger Canyon Road with the rugged, forested Bangtail Mountains directly to the east, the 4,925 sq. ft. 5 bedroom house has an attached 1 bedroom guest quarters, a caretaker’s house, and 4 stall barn with tack room and storage. A 5,000 acre cattle ranch is adjacent to the fully fenced parcel, protecting it from development. Stone Creek, a year-round a trout stream, is on the north boundary, with the property having water (and fishing/exploring!) rights dating back to 1878. The main house, with attached guest quarters, is located within a grove of aspen, spruce, evergreen, willow, and cottonwood trees, ringed on three sides by lawns. The 2 bedroom, 1 bath, 800 sq. ft. caretaker’s house and 1,824 sq. ft. barn are at the rear of the compound, surrounded by lawns, raised flower beds, and horse pastures of lush grasses and wildflowers. The acreage is all useable, either for grazing horses or enjoying a barbecue, with terraced, stone-edged flower beds, patios, walkways, and clusters of trees. Beautiful forests and mountains provide a picturesque backdrop directly behind and beside the property, but it is the Bridger Mountains, running full-faced to the West within elk-bugling distance, that dominates the view—towering, mighty, and ever-present. The 3 major buildings—house with guest quarters, caretaker’s house and barn—present a unified “country-casual, inspired-by-craftsman” look. The cluster of buildings, rolling lawns, gardens, with solidly fenced corral and pastures feel timeless and tranquil, a homestead ready to provide sanctuary for any number of people, dogs, cats, horses, and toys associated with an active Montana lifestyle. The exteriors of the buildings share a common cinnamon brown color with white trim and clad windows. Both the house and caretaker’s exteriors are lap-sided cedar stained the rich and appealing cinnamon hue, and the wood pole barn is the same color. The main house has a woodsy feel to it, completely fitting its setting and surrounding topography. In 1999, the existing house was taken down to the foundation and this home was built on the original footprint. They designed the home for the location, the weather, to better capture the views, and create a relaxed, comfortable Montana living space.